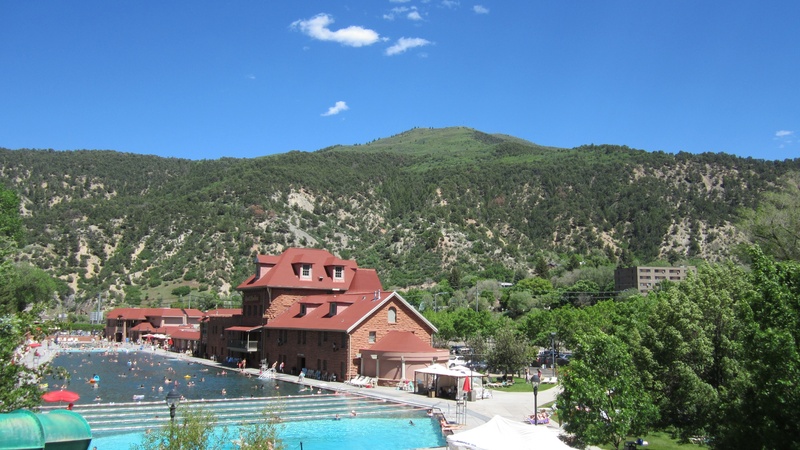 The radio towers on Lookout Mountain are visible from Glenwood Hot Springs. 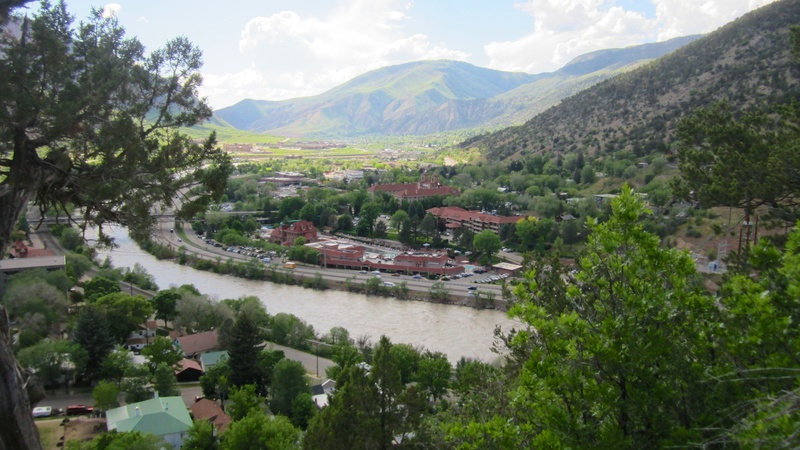 From 30 May to 3 June 2014, I was in Glenwood Springs, Colorado to present a paper at the 42nd annual North American Society for Sport History (NASSH) convention. After the first full day of listening to some fascinating paper presentations, I decided to forego dinner in favour of doing a short solo hike. 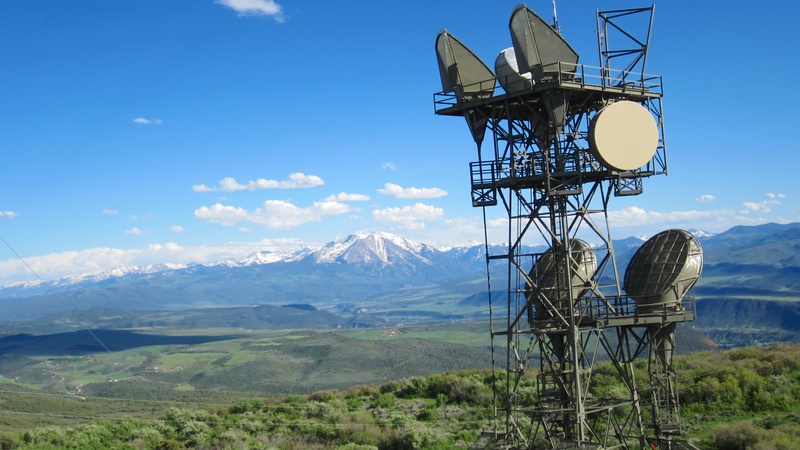 I was curious about the mountain which dominated the view from my window at the Hotel Colorado, and could see a couple of radio towers near the top which looked like they would give a great view of Glenwood Springs and the surrounding countryside. 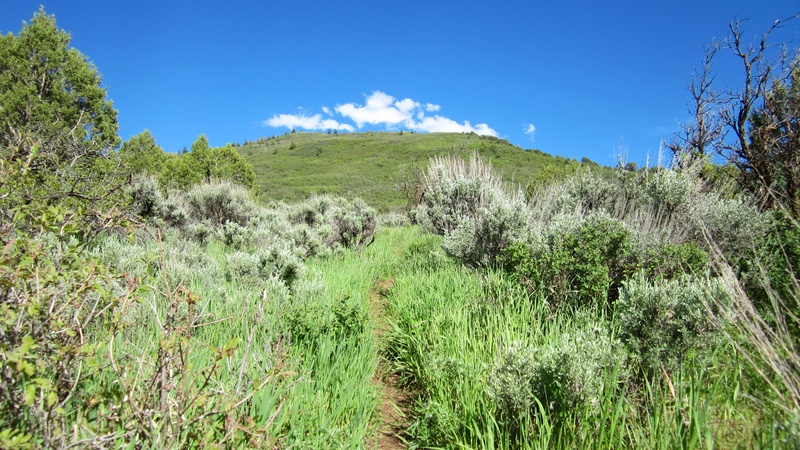 After a quick investigation (talking to locals and Google Earth) I discovered that this was Lookout Mountain and that there was a trail leading from town to the towers. 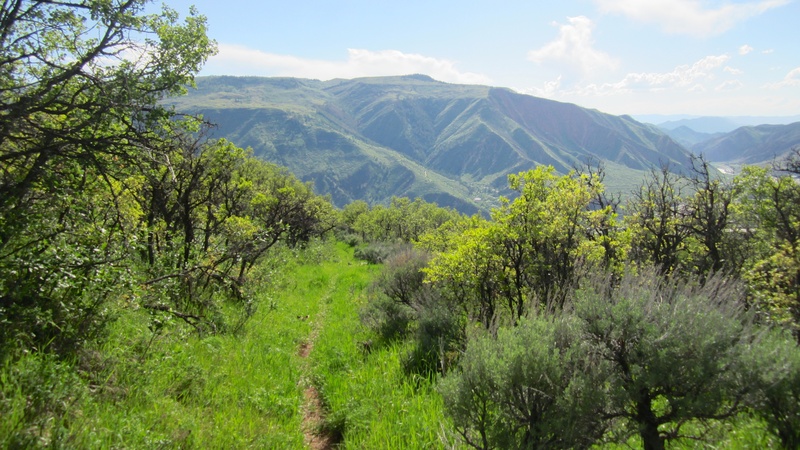 The actual summit of Lookout Mountain is located several kilometres to the east and could be reached via the Scout Trail. I gathered that while many people visit the radio towers, not many people venture to the summit. My plan was to try and get to the summit from the radio towers via a connecting road. Unfortunately, after a 4km hike along the road I came to several ‘Private Property / No Trespassing’ signs which prevented my access to the true summit. Instead, I settled for reaching the highest point next to the summit which boasted a US Geological Survey Witness Post and was only 29m lower (I’m hoping this wasn’t on private land!). I don’t recommend following my route from the radio towers but nonetheless, it was still a great way to spend my evening. 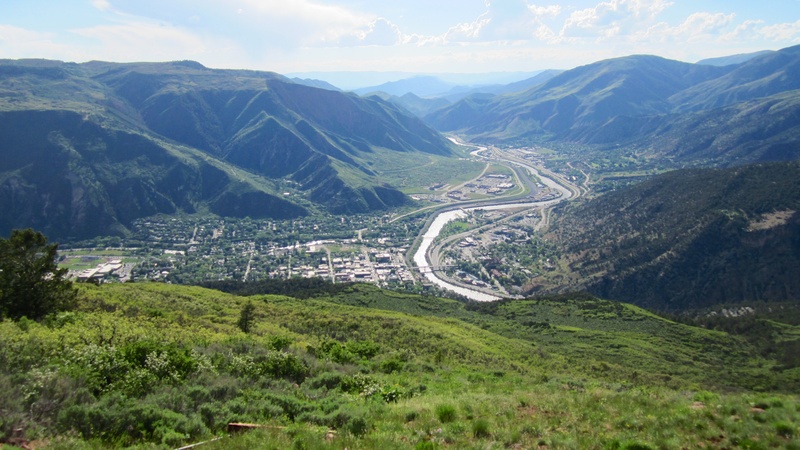 Glenwood Springs is a beautiful little town that is located west of Vail and Aspen. Home to the world’s largest mineral hot springs and the final resting place of Doc Holliday (gunfight at the O.K. Corral fame), there are many activities and attractions nearby. 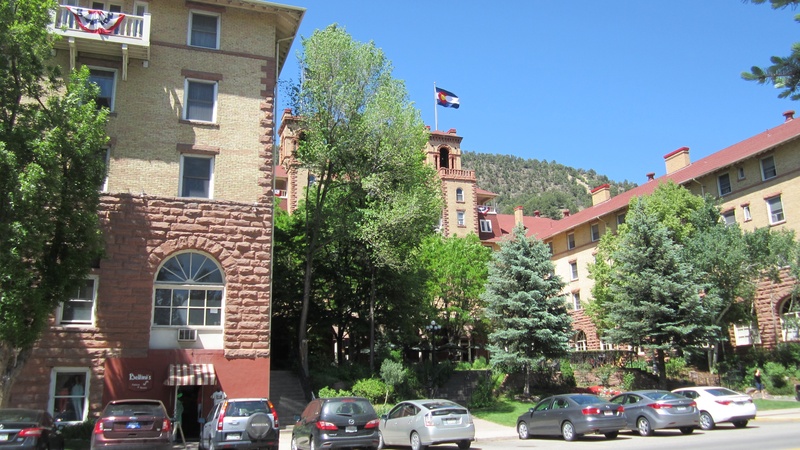 My route up Lookout Mountain began at the front doors of the beautiful Hotel Colorado, which was built in 1893. After crossing the Colorado River over the pedestrian bridge I turned left and followed 7th St until I came to Minter St, where I turned right. When I came to 8th St. I turned left and followed it to the base of the mountain. 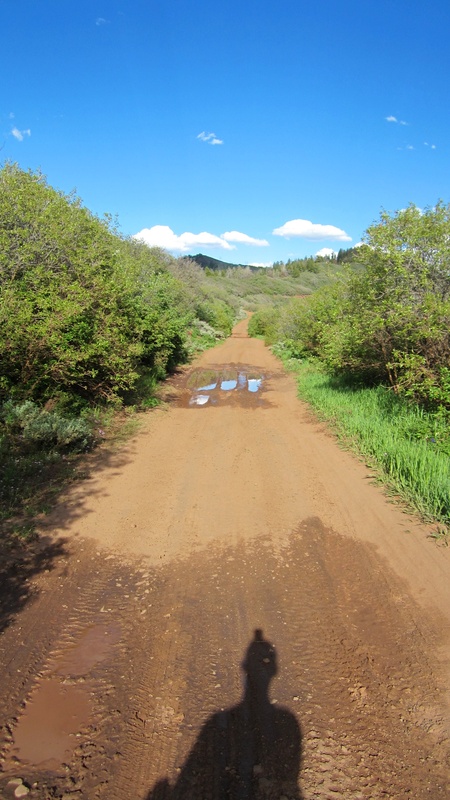 The trailhead is located on the left and looks like it is attached to someone’s backyard. 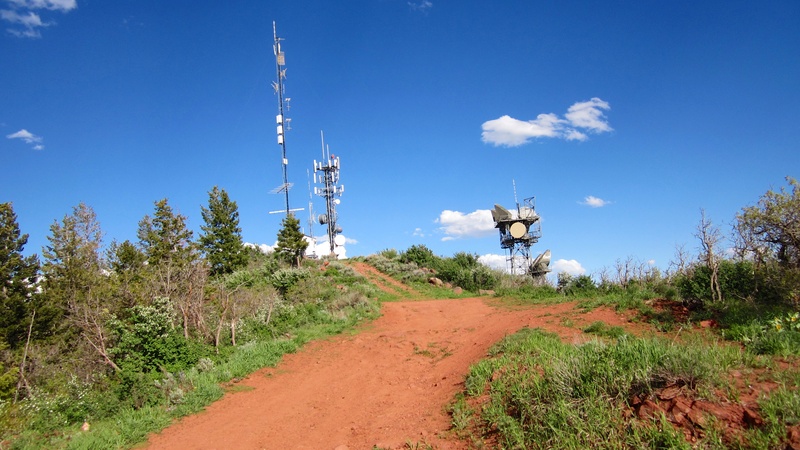 Instead of following Scout Trail, I followed the well worn trail up to the radio towers. Once I was at the radio towers (2433m) I could not find a path which led in the direction of the summit so I followed a well maintained road for about 4.3km until I came to the private property signs. I backtracked several hundred metres and found a piece of blue flagging tape hanging from a tree and speculated that it might indicate a way to the highpoint above me (I hope I wasn’t on private property). 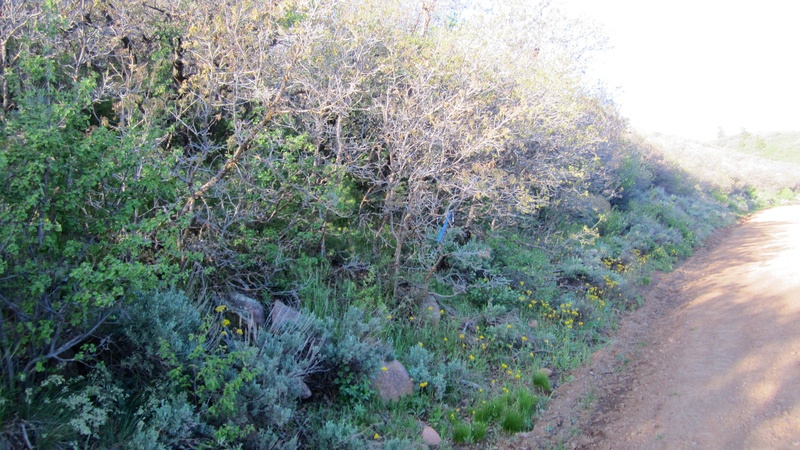 There was a rudimentary trail that lasted for a bit, but then I was left on my own to bushwhack through the oak thickets. Finally I saw a survey stake and a small cairn nestled in the bush and this was my consolation prize for the evening – an unofficial high point of 2605m. I then backtracked the rest of the route. 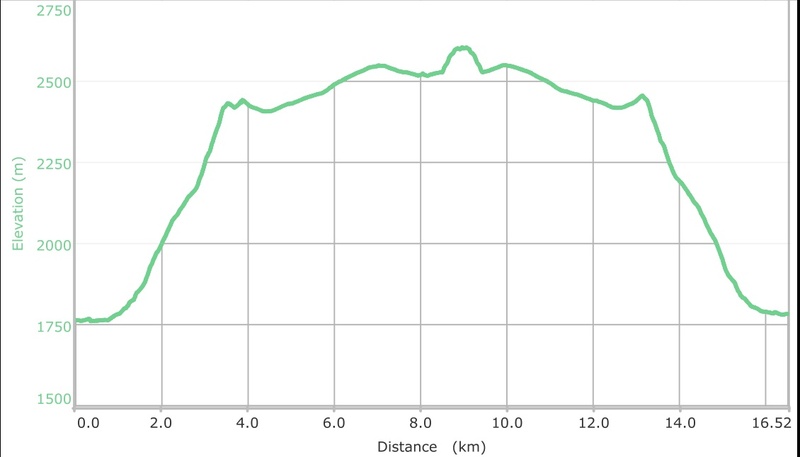 The total distance for my evening solo hike was 16.5km with total elevation gains of 1005m. My total time was 3hrs and 56 min. My starting and ending point: The Hotel Colorado, built in 1893. 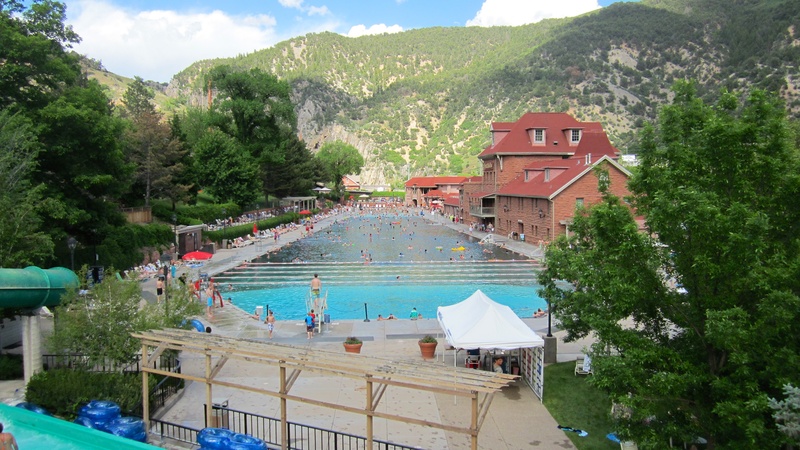 Just outside the front doors of my hotel is the Glenwood Hot Springs, the largest mineral springs in North America. Why it is shaped like a coffin is beyond me. A portion of Lookout Mountain is in the background. 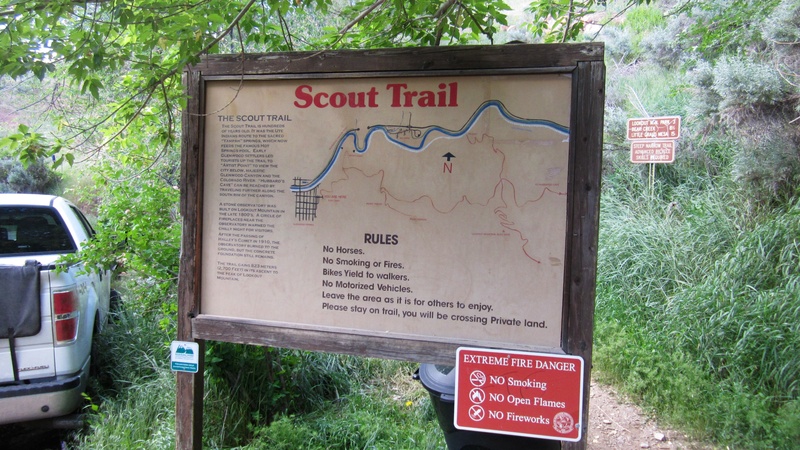 The trailhead sign is next to someone’s driveway and backyard. 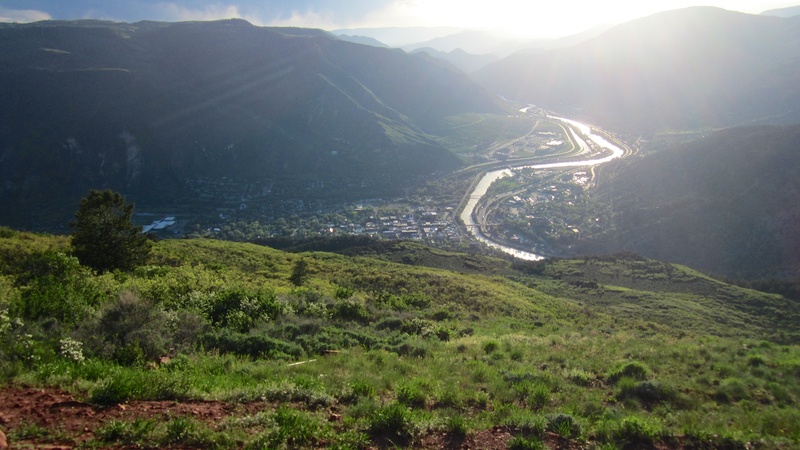 Looking back on Glenwood Springs and the Colorado River from a short distance up the trail. The Hotel Colorado is in the centre. Looking up to the radio tower from the initial desert-like portion of the trail. 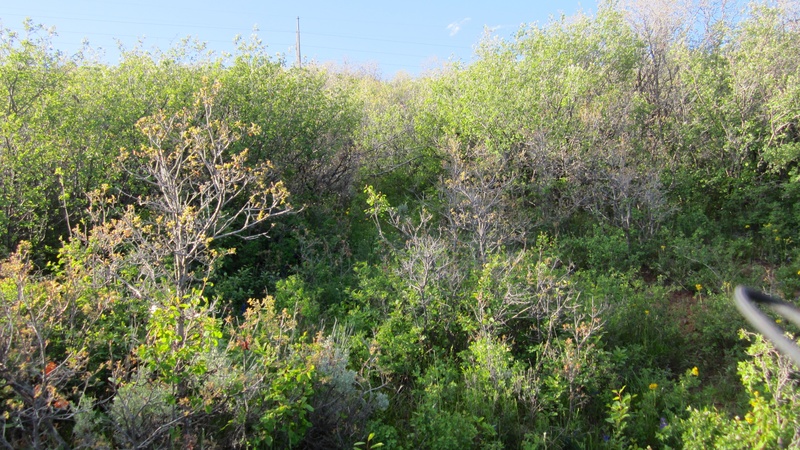 Half way up the vegetation changes to oak thickets and grass. 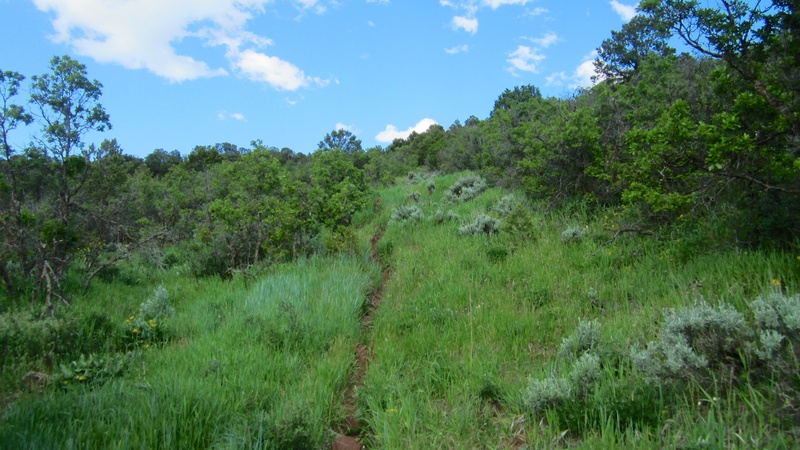 There is a stretch between the initial climb and the final climb to the radio towers that is an easy walk through the grass. It was a hot day and I didn’t have a hat so I improvised by using a mid-layer that I was carrying. I thought it made my shadow look like Robinson Crusoe… or a sand person from Star Wars. 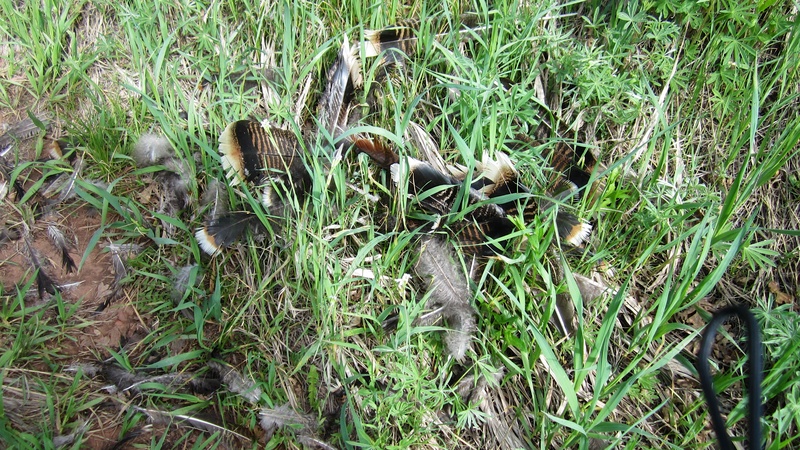 I came across a fowl deed. Not a happy ending for this raptor. Looking back along the trail in the easy section. Red Mountain is in the background. The final section before the radio towers. Nothing technical, just straight up the path. 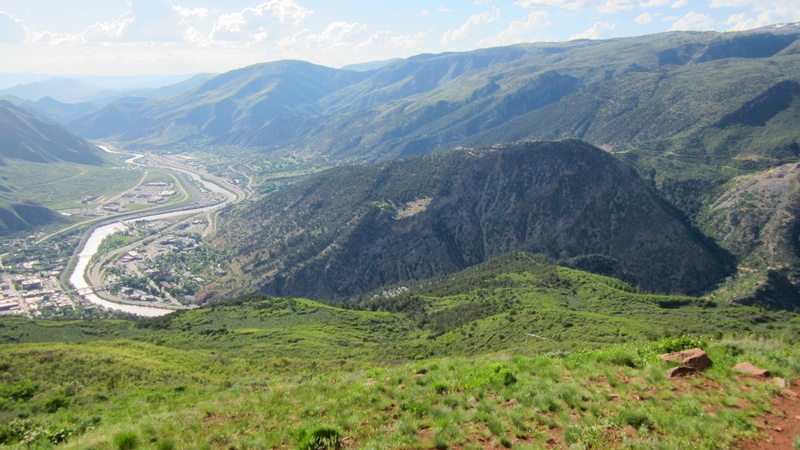 Looking west down at Glenwood Springs from the radio towers. Red Mountain is on the left and Storm King Mountain is on the right. 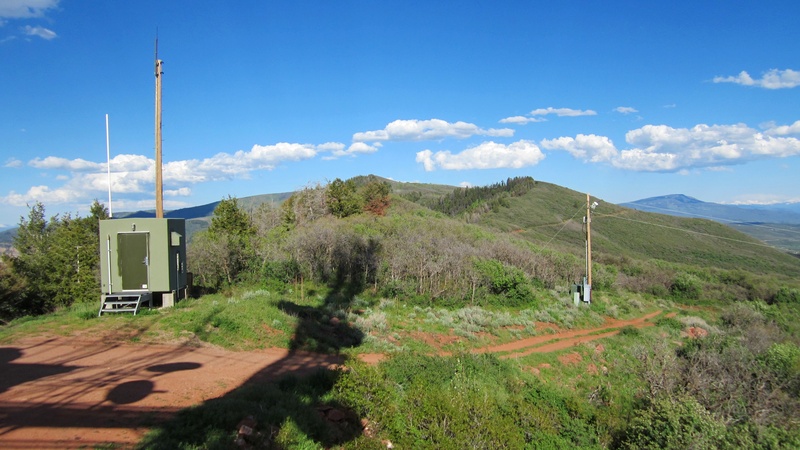 A gondola will take you from Glenwood Springs to the top of the little mountain pictured. At the top, there is a ride that will slingshot you out and over the cliffs above the Colorado River. I could see it in operation from the trail and it looked pretty freaky. 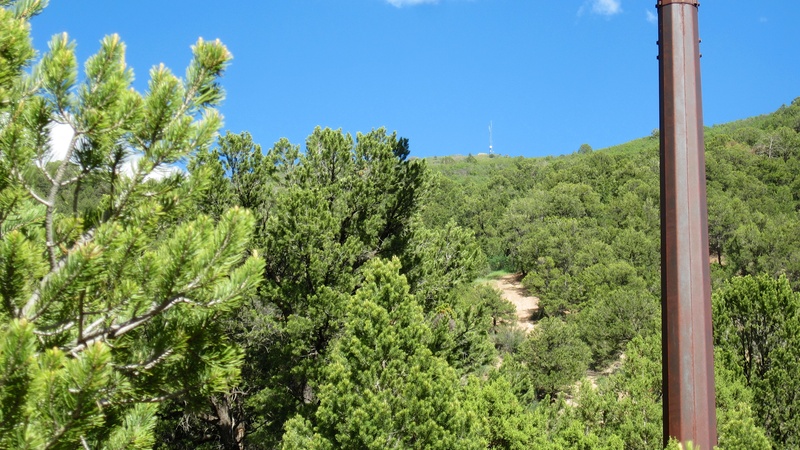 The trail connects to an access road to the radio towers. Looking to the southwest. 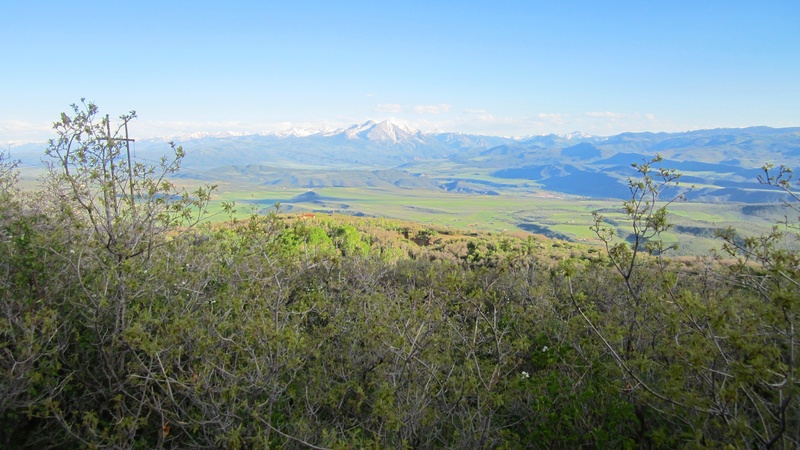 I think that is Capitol Peak and Clark Peak. Looking east toward the summit (not pictured) of Lookout Mountain. The bump in the distant middle was what I ended up having to settle for. 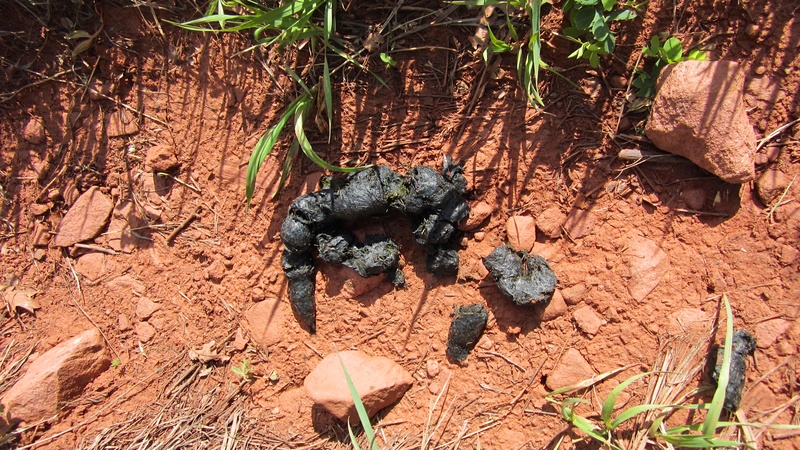 It was an easy stroll along the road. 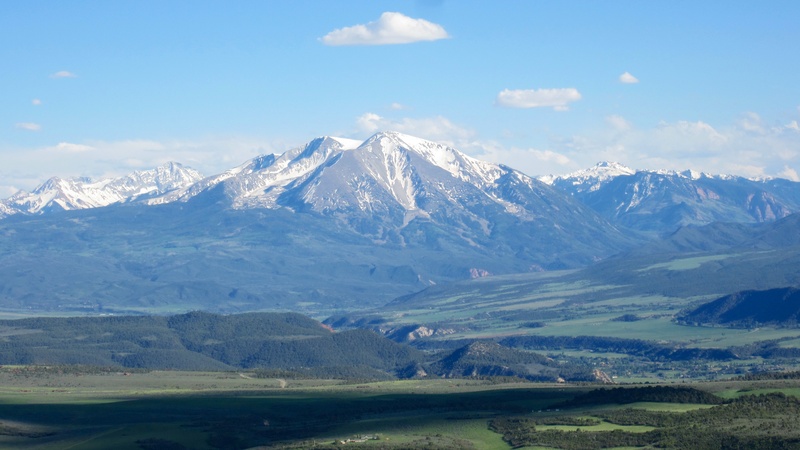 Again, I think this is Capitol Peak and Clark Peak. At any rate, it’s an impressive looking massif. 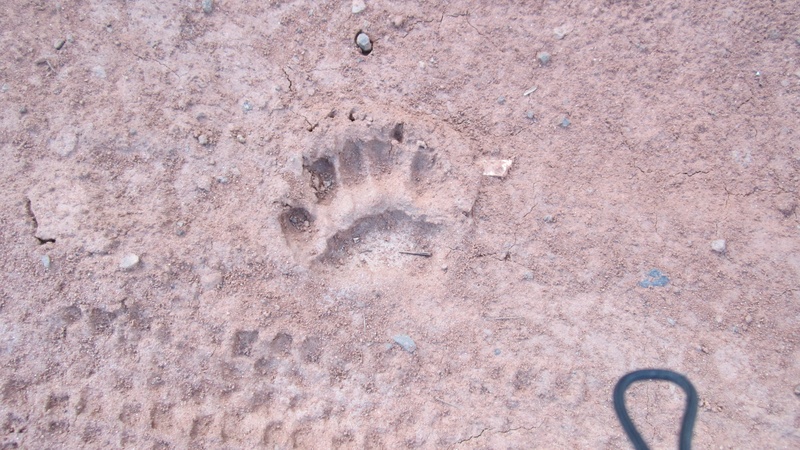 Black bear tracks on the road. 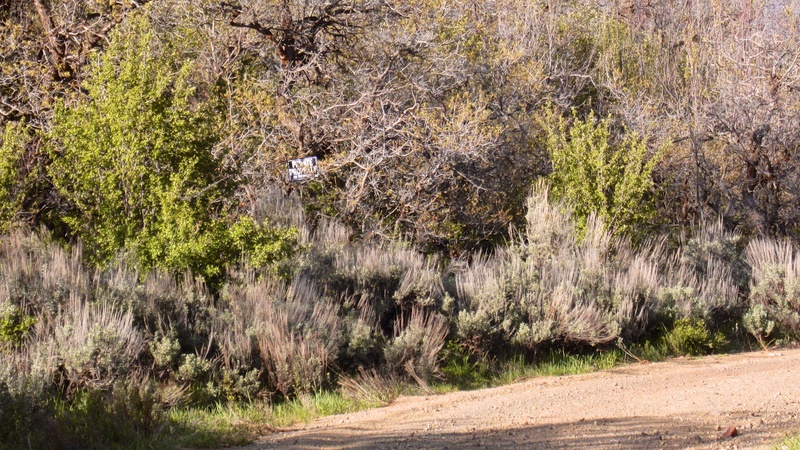 I would later scare one off the trail on my way down. 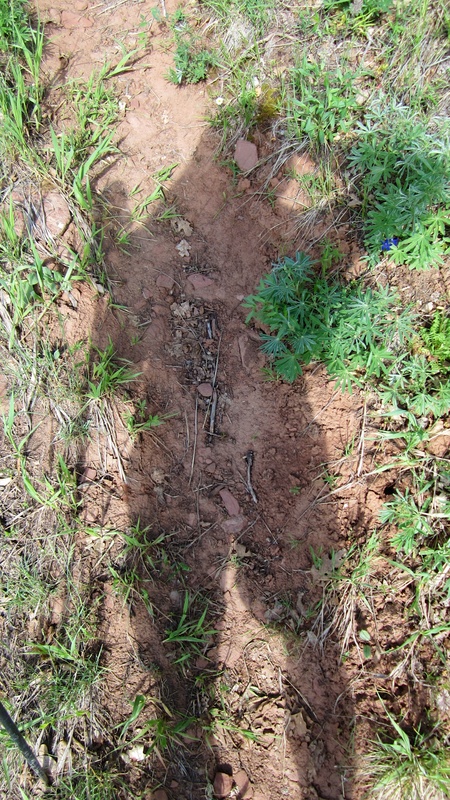 The furthest point that I reached along the road was where it forked into 3 lanes – and all 3 had private property signs. The road on the left looked like it led to the summit, but after seeing the sign and I had to turn back. I backtracked a few hundred metres down the road and came across a piece of blue flagging tape. 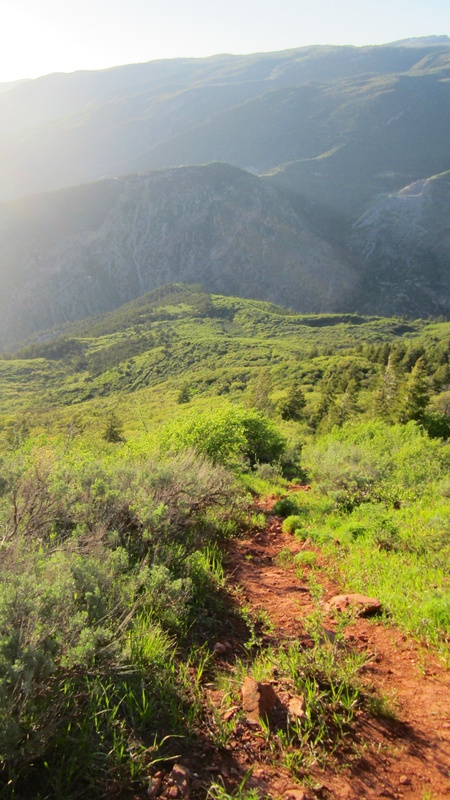 I interpreted this as the location for a potential route to the top of the high point, so I started up a rudimentary trail. I really hope that I wasn’t on private property! Bushwhacking through the thickets towards a power pole. 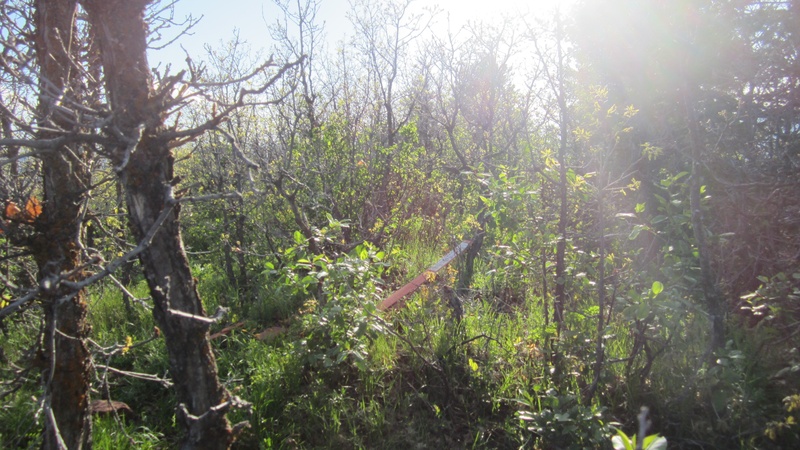 The survey marker witness post and a small cairn were located in fairly dense brush. 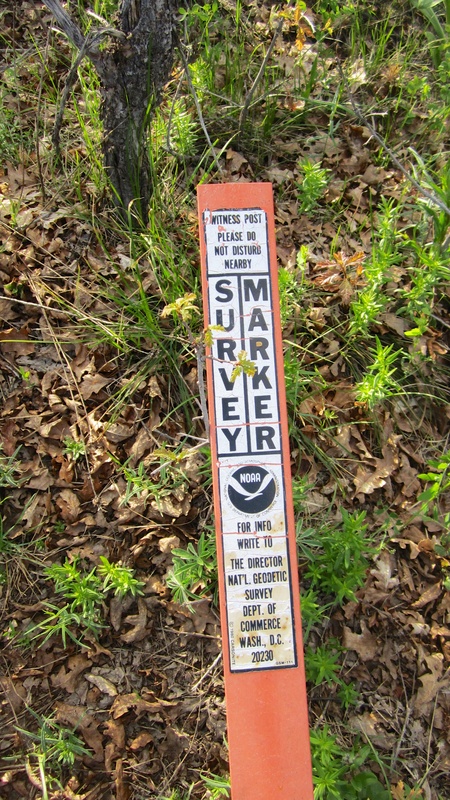 A more detailed picture of the witness post. 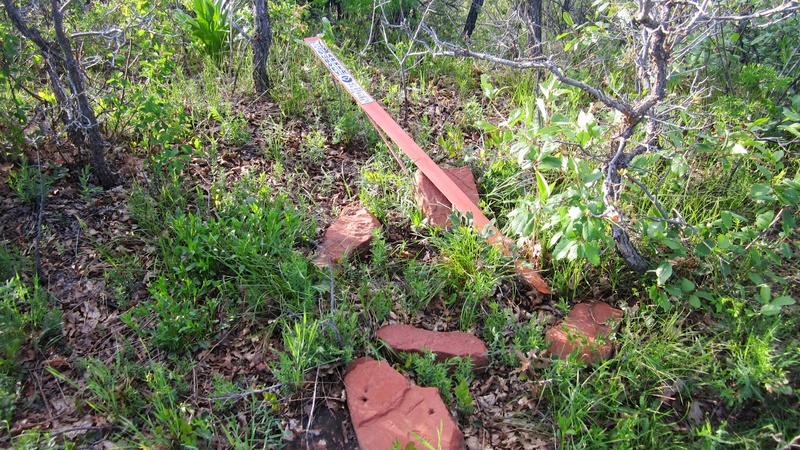 I would not emulate my route from the radio towers to here because you can’t reach the real summit from the road due to private land, and it is possible that this marker may even be on private land. …except for the view to the southwest. 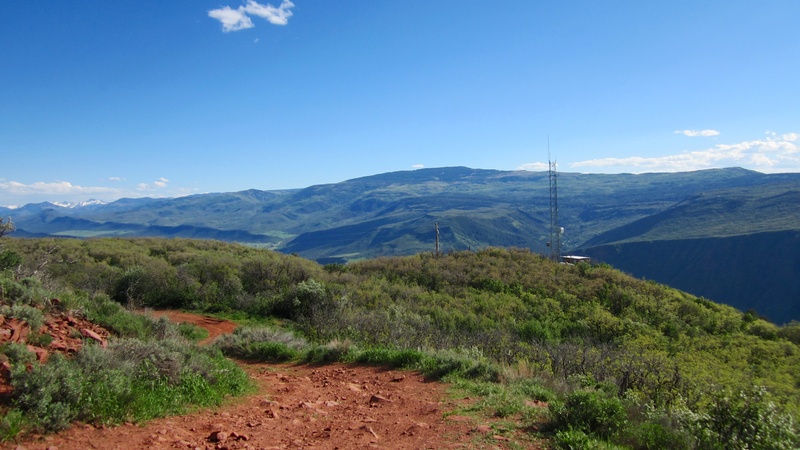 After backtracking my route, I started down towards Glenwood Springs from the radio towers. 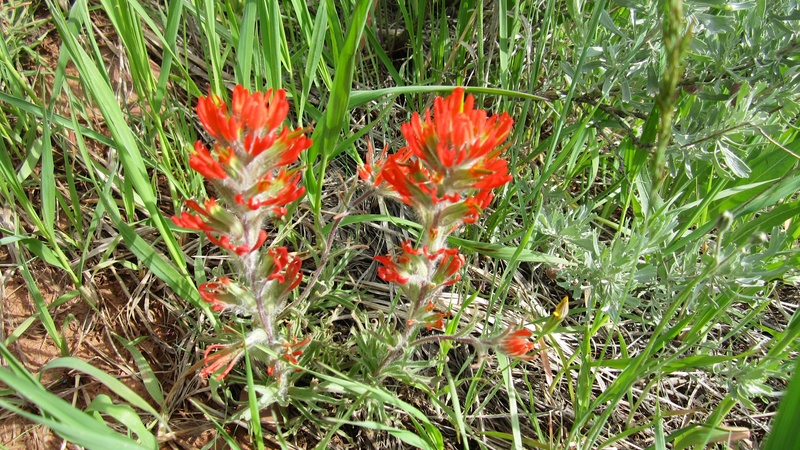 About halfway down, my habit of yelling every 50-100m while hiking, startled a black bear who was walking next to the trail. 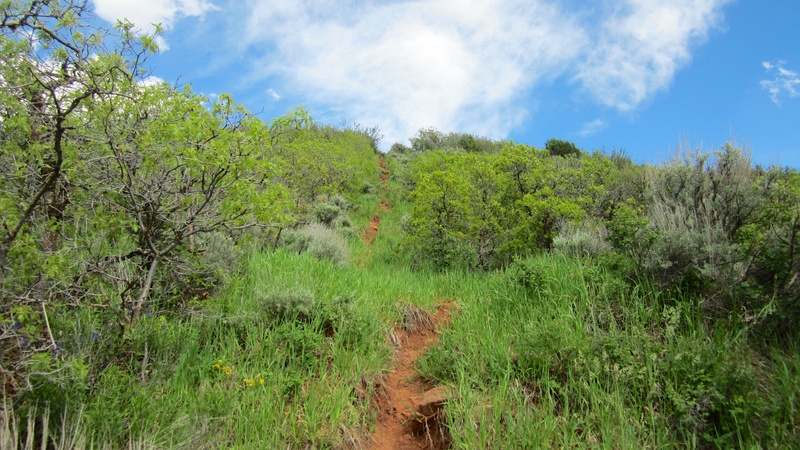 He wasted no time in crashing through the thickets and disappearing into a gully, leaving me alone again to enjoy a pleasant hike back to Glenwood Springs. I arrived back at the hotel 3 hours and 56 minutes after I started, just in time to shower and snag a quick supper at a nearby restaurant. Even though I was unable to achieve a summit due to restricted land access, it was a great way to spend an evening.